I've always enjoyed painting my nails but sometimes it just feels like a lot of work therefore I never really keep up with it. Well now I'm back on the wanting to paint my nails kick. With the discovery of pinterest and nail blogs I have rekindled my interest in trying my hand at some different type of nail art. For now I am just keeping it simple and hopefully in the future try new things. China glaze is one of the very popular brands that I have finally gotten to try. I will admit I had never wanted to really try the higher or well known brands, therefore just sticking with some of the inexpensive store brands. Well after trying China Glaze I have been converted. Below is my first time using China Glaze. The main color is called Dorothy Who? from the Wizard of Oz collection. 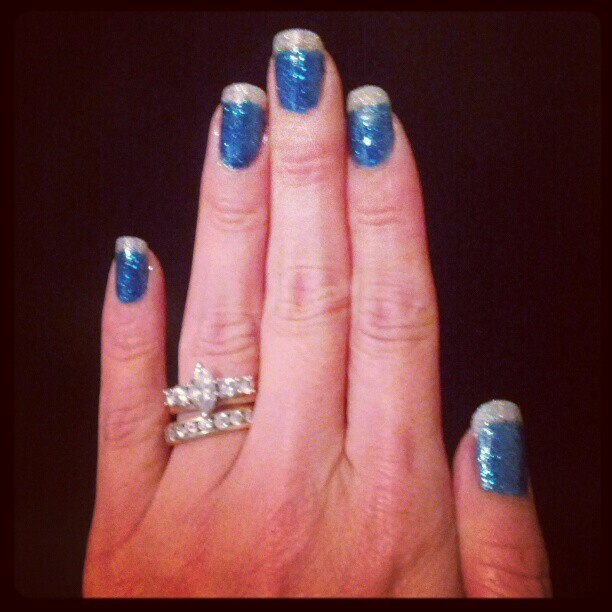 The tip is done with glistening snow from the Holiday 2012 collection. I used 3 coats for each color and topped it off with Seche Vite topcoat. Bottom line is I LOVE this look. I am in love with the Wizard of Oz collection and the Holiday 2012 collection.